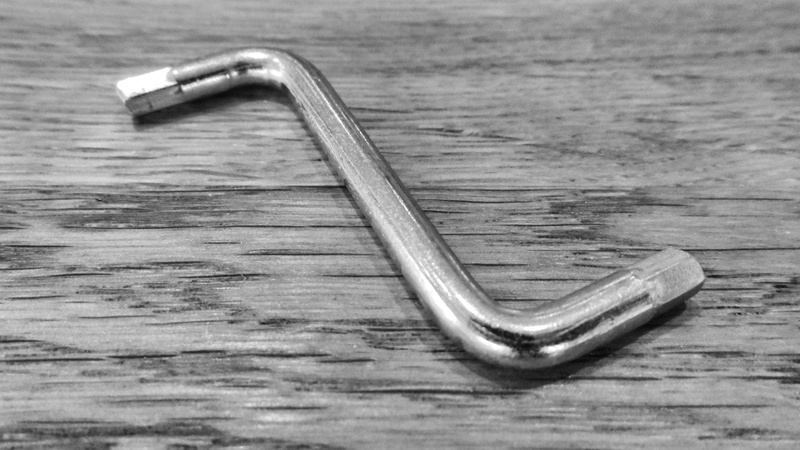 The Ikea Allen Key, designed for a single use. Light & cheap, not strong. Keith Bontrager’s well-known quote, “strong, light, cheap, pick two”, still rings true when it comes to bike components. It’s a very simple but incredibly effective description of any bike parts, or engineered components in general. If something is strong & light it’s not going to be cheap, i.e. a top end carbon frame. If it’s light & cheap it’s not going to be strong, we’ve all probably broken something that seemed a bargain at the time, whether it was a lightweight seatpin, superlight bottle cage, or minimalist chainring. If it’s strong & cheap, it’s not going to be light, such as that first ‘racer’ frame you had as a kid with the ‘gaspipe’ tubing. Lets see where can you save a bit of cash & still get the performance benefits? Before we venture into actual parts, there is a golden rule that could save you a lot of heartbreak. “Don’t race it if you can’t replace it”. It’s all well & good taking your incredibly expensive bike out with trusted comrades who are very unlikely to cause a spill. That trust generally goes out the window when you have a number on your back, potentially with 79 other individuals, in a highly competitive environment, all intent on stopping you winning the race, by whatever means necessary. Another area where the rule could be applied is in a sportive, although not the same cutthroat attitudes as a genuine race, you may still encounter some aggressive behaviour, which isn’t partial to maintaining your pristine machine in its current immaculate condition. Frame material choice is a much disputed subject, in the end it comes down to personal choice as I emphasised in blog ‘You’ve Been Framed‘. Costs are vastly different & weights also vary considerably, so I’ll take some examples from popular manufacturers you’re likely to find (or order) in your local bike shop, with a similar-use frame. Kinesis provide a very close comparison, their Granfondo frameset comes in Scandium & Titanium (Scandium is an Aluminium alloy with different weld characteristics provided by a 0.5% Scandium in the alloy, so not really Scandium as such, just a little bit in there). The Scandium frame comes in at £750 for a weight of 1.46kg for a 57cm frame (excluding forks). The Ti frame costs £1500 for a weight of 1.56kg. So we’re talking twice the price for the same product, in a different material. Generally standard Aluminium & Ti frames come in around the same weight, although you will find some very light ones, but you’ll pay for this, as the rules state. What you’re paying for in the Aluminium versus Ti battle is strength, the Ti frame isn’t going to corrode over your lifetime, it’s highly likely it’s going to outlast you. The wall thickness of the Aluminium required to provide an oversized tube at this weight is very thin, so it’s more likely to get dented in a crash, a Ti frame will mostly survive all but the worst possible crash fully intact with a couple of scratches (plus you won’t ruin your paint, most have none). Steel is making a comeback, with bespoke framebuilders like Brian Rourke now using top end steel products like Reynolds 953. This material can result in a frameset weighing maybe 0.1 to 0.2kg over an Aluminium or Titanium frame, still lighter than the old school steel frames you may have raced on for decades. The advantage is that you can have it made to measure, not anything like as popular as it used to be, but has some advantages over off-the-peg frames. This can work in one of two ways, you can either know a good bit about frame design & characteristics, handling & fit, or you can know nothing. An experienced frame builder will gather your information, help you choose what you’re looking for & build a frame for you that rides as you like it. The sit down & chat with the frame builder is an eye opener in itself, I’d advise everybody to do this at least once, it’s an enlightening experience & will remove some of the demons you created by buying that fake Pinarello from China. You’ll like the bike it results in. A custom 953 will cost about the same as a Ti frame. Carbon fibre, in its many guises, is now the standard for a road bike. But unlike a metal tubeset, not all frames are the same. If you buy cheap, the quoted weights are similar to the metal frames, which indicates that the material is not being used correctly, you’re buying it just to have a carbon looking frame & you’d probably be better off with a metal frame. This is down to the fact that in order to reduce weight in a carbon frame you need to know where you can safely reduce that weight & improve the ride characteristics. The development costs involved in this are quite high, with modelling & finite element analysis being employed to detect the areas of highest stress. The cheaper frames don’t do this, they take the hit on the weight & provide you with the product you want to buy at a cheap price, wrapping as much carbon as acceptable to make sure it’s not going to snap. The cheap frames should be safe enough due to this, but be very wary of any carbon frames that are cheap & light, it’s safe to assume that they will not be strong. The lightest carbon framesets are probably in the region of 1.0kg, but you’ll pay for this, the bottom end of the carbon market seem to add an additional 3kg into their frames, whether in carbon or resin I don’t know. Carbon frames probably show the strong, light, cheap rule in its full splendour, the perfect example of the philosophy. Another example, clip on triathlon handlebars for time trialling. As an example, the Oval Concepts S-Bend comes in two varieties, aluminium & carbon fibre. The profiles are exactly the same, both round, so there is no aero advantage from the carbon extensions, they are also both strong enough for the purpose, the only advantage is weight. The carbon variety (model 950, rrp £109.99) weigh 510g, the aluminium set (model 750, rrp £79.99) weigh 551g, so for an additional £30 you save 41g. To put that in perspective, a bag of crisps weights 35g. What this tells us, is that saving that extra £30 if you’re riding flat time trials isn’t going to make any difference for the tiny amount of additional weight, we’ll get to a different scenario later on, under ‘Marginal Gains’. The diminutive bottle cage tells us a lot about the strong, light, cheap rule. There are plenty of standard bottle cages, which work perfectly well, are robust & don’t weigh very much. Also on the market are various lightweight cages, titanium, flimsy aluminium & carbon. These super-lightweight cages only save a few grammes, but cost multiple times more than the trusty standard cages. In my experience, you need a malleable cage, so it holds your bottles in place over bumps, especially hiding in the wheels in races when you can’t see the bumps coming & avoid them. We can really put these into the marginal gains area. This is a much documented phrase, brought to the cycling public’s attention initially by Team Sky, but now generally adopted as a means to improve performance. If you’re not familiar with it, the ‘aggregation of marginal gains’ involves combining multiple small improvements to create a combined large improvement. As an example, shaving 10g from 50 components to reduce weight by 500g, a significant combined improvement, created from a large number of seemingly insignificant improvements. The main component & materials area where these improvements have been considered is not necessarily in weight, due to the UCI’s 6.8kg minimum weight rule, but in aerodynamics. In a round-about way, the UCI’s unfair rule has forced teams to look for technical advances in other ways, one of which is aerodynamics. This isn’t a new thing of course, the phrase is relatively modern, but Merckx was drilling holes in chainrings to reduce weight decades ago, a practice which would now be frowned upon by the wind tunnel testers as it would produce more turbulence than a smooth surface. In those days weight was measurable, but aerodynamic drag was not, so weight took preference. Today, we see many drag saving components available to the club rider, but these need to be used correctly in order to gain an advantage. My personal gripe is with aero drop bars, with the ‘tops’ area shaped into an aerodynamic wing profile, great if used correctly, very bad if not. You’ll often see the aero section at an incorrect angle to allow the rider to be comfortable on the drops, creating much more drag than a round bar, such as an F1 cars ‘trim’ creating plenty of downforce on corners but reducing its top end speed on the straights. The other issue is that if you set the bars in the horizontal position, then your hand position & angle on the drops is determined by the manufacturer, which is probably not ideal for most, as we know the human body causes the most drag, so changing that is going to cost even more speed. I’m not a fan of these bars for those reasons, but they do look nice, so if you’re more interested in aesthetics than performance they might be correct for you. If you’re buying an off the peg bike, it’s worth noting where manufacturers are saving money or weight, a quick look over the full specification can reveal some important clues. When constructing a bike yourself, be very aware of the ‘strong, light, cheap, pick two’ rule. You can mix & match, buy a frame which may not be the lightest, but rides like a dream & seek out light & strong components, it’s possible to bring most race frame builds down close to the UCI limit of 6.8kg for the full bike, you just need to be smart about it. Consider what & where you’re riding, the lightest TT frame isn’t going to give you an advantage if you ride flat time trials, but if you’re into hilly ones, it may have an impact. If you’re carrying an extra 10kg round the waist & you’re seeking out very expensive frames that weigh less than 1kg, you’re opening yourself up to some ridicule. Best to sort out that belly first, ride your bike & then worry about weight when it’s going to make an impact on your overall (bike+rider) weight. Half a kilogramme in extra bike weight is insignificant if you’re already carrying an extra 8 frames-worth in body fat. As a coach once told me when I used to fuss about such things as tiny weight savings, “go and have a proper visit to the toilet before a race, that’ll make just as much difference”. Steel, carbon, aluminium, titanium, we’ve even had metal matrix composite, wooden & magnesium frames (Kirk Precision), but what’s best for you & is one of the cheaper carbon frames actually a better bet than an aluminium frame? It used to be Reynolds 531, that was what you bought if you were a UK cyclist over 30 years ago, we then started getting different steel tubesets from Columbus, Reynolds 753 (a thinner walled higher tensile steel), Reynolds 653 (which wasn’t a tubeset at all really, but a mix of 531 & 753). These frames were manufactured by a process called brazing, which used lugs & solder. The tubes were mitred (shaped at the end to meet the profile of the adjoining tube, keeping it very neat), set up on a jig & heated with oxy-acetylene torches, the solder melted & assuming you knew what you were doing, filed the small gap between the inside of the lug & the outside of the tube by ‘capillary action’. This was very much an acquired skill on the better tubesets, any old chopper could braze a plumbers tubed bike, but when you started getting down to tubesets of wall thickness 0.7mm, you had to be a skilled craftsman. Britain was awash with these skills, there were steel frame builders everywhere, you could visit the workshops & see the men in action, goggles & torches, a step into yesteryear. There is a resurgence in the steel frame, but it’s very much a niche market, you’ll barely see anybody racing on a steel frame these days, where in the past it was the only option. There are exceptions though, the Madison Genesis team in the UK ride steel frames, there’s a profile on Dean Downings HERE. Another exceptional modern steel race bike I’ve seen close up is James McCallum’s Condor Acciaio, these bikes show that is still a place for steel amongst the carbon. You’ll see that these frames are not lugged, they are built in the non traditional method for steel of TIG welding, this wasn’t something that was possible with the older tubesets, but since Reynolds developed products like Reynolds 853 a number of tubesets have been developed. Aluminium frames were the start of the downfall for steel, we saw some incredible looking frames appear in Scottish races, big tubes, filed welds on bikes like Klein & Cannondale from the US. That opened up the market to flood with mass-produced welded aluminium frames (wrongly called alloy, all the steel frames are a steel alloy too), they were cheaper & lighter than made to measure steel frames. The initial frames with tubes of steel diameter were not particularly resistant to fatigue, there were a large number of failures as manufacturers tried to get their aluminium bikes on the market with little R&D, the smart manufacturers had opted for oversized tubes with very thin wall thickness, resulting in a much more durable frame. The incredibly sloppy Vitus was one that used small diameter tubes, but even with these problems and the inbuilt flex, riders like Sean Kelly still managed to win lots of races on them. Some manufacturers were scared off & held off far too long, like the UK’s ailing Raleigh, who were never to regain their market share in top end race bikes (although they are making a resurgence at the moment as more of a distribution business than a bike manufacturer). Aluminium was the key point in mass market frames being produced, welding had allowed the frames to be manufactured without the skilled craftsmen required for brazing operations, they could now robot weld en-masse & flood the market. We did have a large number of very heavy frames appear, where they were churned out into the market, but most riders would have been better off with a steel frame rather than these oversized tubes with very thick wall thicknesses, not able to soak up the bumps from Scottish roads, but they are probably still going, it’ll take them a while to corrode through. Carbon frames started appearing about the same time as Aluminium frames hit the market, at this point in time they were just using standard tubes bonded into aluminium lugs. This wasn’t a method that brought out the best properties in the material, it was also prone to a few early failures & some unhappy riders. The same with carbon forks, you just have to ask coach Graeme Herd about that one, he had an unfortunate episode where he used his face as a brake when a carbon fork failed. The first ‘proper’ carbon frames I saw in races here were those similar to the ones that Kenny & Roddy Riddle were riding, the Trek, they looked incredible at the time, as most other frames in the bunch were lugged steel. These frames (correct me if I’m wrong on this) were again constructed using pre-formed carbon tubes, but joined in a very different manner, they were held in place by jigs, the joints over-wrapped in carbon fibre & resin, then baked to form fantastic looking & strong joints, resulting in a very similar looking frame to the eventual mass production monocoque carbon frames we see today. The modern ‘monocoque’ frames use no pre-formed carbon tubes, they are the best use of carbon fibre’s properties, manipulating specific shapes at certain areas of the frame which require strength in specific directions. ‘Mono’ is perhaps not the true story, as these frames are formed in at least two parts, but often the rear triangle is often made from the older bonded method. For example, what would be considered the main frame diamond (top tube, down tube, seat tube & head tube) is constructed as one part, then the rear bonded triangle is attached, wrapped & baked. The ‘monocoque construction’ sticker is always on the main triangle for this reason. As with everything, you get what you pay for. The mass market aluminium frames flooded the market after the first frames appeared, the same has happened with carbon frames. The lower price ones do look fantastic, but if you check the weight you’ll see that although they’re strong, many will be overly wrapped in carbon. The reason that many top end carbon frames cost a lot more is down to R&D, if it was just material price we’d be buying them for pennies (well, you know what I mean). R&D plays a vital role is carbon technology, without good reasearch & development, backed up by high quality manufacturing, you’re not going to get the ideal carbon product. Computer modelling allows carbon to be placed in the correct areas, in the correct direction, in the correct quantity, this isn’t just for strength, it’s for the ride too. Carbon frames can be constructed incredibly stiff, but good frames need ‘a bit of give’, some compliance so that you’re not bouncing all over the road on anything but the smoothest surface. This is a trade-off & is very hard to get right, you want stiffness to avoid the frame twisting when you pedal & sprint, but you want compliance to soak up road bikes. Steel & titanium do this very well, aluminium had to have the correct mix of frame tubes, carbon does it well on a frame built with this in mind. The result is that some very stiff carbon frames that pro riders use in many races (not the ones they ride in the cobbled classics obviously) are potentially too stiff for our rubbish roads, the same goes for the overly engineered cheaper carbon frames, where too much carbon has been used (excessively skipping back-end under a sprint is sure sign). So unfortunately for most of us, a higher end carbon frame is really the one that’s going to do the job to the best of its abilities, but potentially not the one used in le Tour, but do your research and ask the questions, make sure you’re paying for R&D and manufacturing quality, not branding or product endorsements. Lighter riders often suffer more on carbon frames too, they are generally built for an average 75 to 80kg mass market rider, not a whippet, so if you’re light you are going to find even less ‘give’ in a carbon frame without the larger gentleman’s ‘pre-load’. I’m not going to tell you what to buy, but just bear in mind the plusses & minuses stated above. Most decent aluminium frames are of good construction & technology these days, I’d say that a good aluminium frame is going to be a better bet than a cheaper carbon frame, in my opinion it’s only when you go up-market a bit with carbon that you get the benefits. Apparently Phillipe Gilbert rode an aluminium frame tarted up to look like a carbon one for one of his very successful seasons, so sometimes the pro’s won’t choose the most expensive option either. There’s always the custom steel & titanium options, the type of top end steel frames highlighted above are good enough for UK domestic pro’s, they’re likely more than sufficient enough for you & steel is on yet another revival making it a viable choice yet again. They can also be built made to measure, in the UK, if that’s your thing. Titanium is a very good overall frame material, bomb-proof & will last you a lifetime, but expensive & if you get sick of it, you’ll be stuck with it forever! Carbon won’t last forever, the good ones come in at the price point of titanium, but they look great, which I think is the point so many riders buy them for, it also holds bragging rights to your non cycling friends, a carbon fibre frame holds more clout to petrol heads than any other material. What do I have? I’ve got all of them, so I can’t even make up my own mind, it’s really down to personal choice, style, engineering, performance, but the old saying from Keith Bontrager always comes into play, especially for bike frames, “Light, Strong, Cheap: Pick two”. You get what you pay for, but don’t get framed.